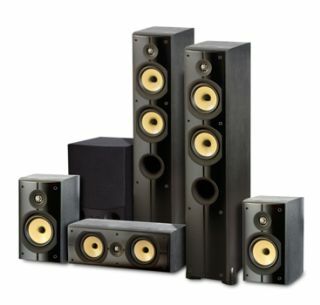 PSB brings Image 5 Series speakers to the UK | What Hi-Fi? Canadian speaker company PSB is bringing its Image 5 Series speakers to the UK through distributor Armour Home. There are three models in the range: the T5 Tower (£599), B5 Bookshelf (£249) and C5 Centre (£229). These, together with the Subsonic 5i subwoofer (£420), make up a 5.1 surround sound package which sells for £1497. The Tower, Bookshelf and Centre are all bass reflex designs and use the same low distortion 25mm Titanium dome tweeter. They also employ long-throw, 13.3cm clay/ceramic filled polypropylene coned bass/midrange drivers: one in each bookshelf speaker and two in each tower and centre channel speaker. PSB's Subsonic 5i subwoofer has a 150W amplifier and 25cm, long-throw driver. All PSB Image 5 speakers are finished in black ash and are available from UK dealers now.